Although the public grand-opening party for West Village's Phase II that was initially announced for last week was postponed until later this spring, a gathering and tour for current residents still took place as planned. My thanks to the West Village staff for letting me tag along to this sneak-peek at the second phase of the project. From what we've heard, commercial office tenants will be expected to start moving in come late spring/early summer, while the search for retail tenants for the Walker building along Main St. continues. (Not an easy timing given the current real estate and business climate.) At one point the West Village folks were reportedly eyeing at least one downtown Durham restaurant for relocation, though it's not clear that anything came of those discussions. But it's apartments that make up the bulk of Phase II, and which will be the first element of the project coming online this spring. The four units we saw last week ranged from smaller studios to a 1,400 sq. ft. two-bedroom; prices for these ranged from about $1,000 to just over $1,700 per month. We're entering Durham's silly season again, and no, I don't mean minor league baseball -- if anything, the early signs out of the Tampa Bay Rays' spring training suggest they won't be a joke this year, hopefully a sign of good portents for the D-Bulls. Rather, I mean election season. No sooner have the buds and dogwoods begun to bloom than we've started seeing election signs blooming themselves, popping up on streetcorners. Erstwhile partisans have been out on the thoroughfares over the last week or so, as evidenced by the "Moffitt" and "Parker" signs, among others. So, fresh on the heels of the City Council campaign this fall, it's time for another round of electoral fun, this time for the Board of County Commissioners. But I suspect this year's campaign may be a little more hair-raising than this past November's campaign. And that reason, simply put, is Obama. What does Barack Obama have to do with the Durham County Commission. Directly, nothing; indirectly, as measured by turnout, everything. See, the County Commissioners will be elected this fall, during the main November election. But there are no Republican candidates for the office; only ten Democratic candidates. With all five seats up for grabs, the Democratic primary for the office will essentially determine who gets elected this fall. Two Durhams: Could inclusionary zoning help? Over the past few days, this blog has -- with a tremendous debt of gratitude to some excellent work done by students in Duke's Urban Economics class -- taken a look at the socioeconomic and class divisions in the Bull City, and how it appears to be an inequality in wealth and opportunity, not race, that influence differential outcomes in crime and education. What's the solution to this divide? It should come as no surprise that there are no easy answers. Some of the challenges are macroeconomic: the fundamental shift in Durham's once-industrial economy has built a wide gap between ex-factory workers struggling to make ends meet in service-sector positions and the new-economy, new-technology and knowledge workers who enjoy relative comfort and good living in Durham and the Triangle. Those factory workers no longer work at American Tobacco; knowledge workers do. And the factory jobs aren't coming back. Other challenges are societal, and at times involve tough issues that have in many ways become so deeply associated with conservative movements in this country that they wash over the ears of political progressives. Teenage pregnancy remains a crisis that typically sustains intergenerational poverty, and the single-parent homes that usually result provide fertile grounds for gang membership as boys seek camaraderie and male attention. Drug addiction destroys economic earning ability in young and old alike, leading to a lack of productivity and, often, a life of crime. There's not the time or space here to address these issues, though I raise them because it's problems like these that present the greatest part of the work to move our city and our society out of today's divides. Instead, I would like to focus on an issue of particular local interest, given its endorsement by Durham's People's Alliance as a desired priority for local government this year: The creation of inclusionary zoning rules in the Bull City. Inclusionary zoning is a term broadly used to describe land use regulations that encourage or require the creation of affordable housing in new developments of a certain size. In part, these development tools -- which got their start in Montgomery County, Md. back in the 1970s, and which are now reportedly in place in 10% of cities with populations over 100,000 -- are intended to ensure that communities continue creating affordably-priced housing, especially in light of trends in many cities that see rising prices in core suburbs lead to longer commutes and more distal development. We've talked at length here before about Durham's public schools, which as a system struggle with lower aggregate test scores on end-of-grade achievement tests and with a broad stigma in the local community. Often, it is school test scores that have driven persons moving to the Triangle to shy away from living in Durham, with Wake County the historic recipient of in-migration as a result. At the same time, we've discussed here previously, at a 30,000 foot view, seemed to provide explanations for why school performance in Durham really was more a factor of underlying socioeconomic factors, not the performance of schools themselves. First, and obviously, we have a national crisis in terms of the education that African-American youth are receiving. That's a complex issue that goes beyond schools and into issues of historic discrimination, underserved neighborhoods, trends in families, and failures of public policy in housing and financial support. On the local level, it looks like the numbers in the Triangle mirror the trends in the nation -- inexcusable as they are. Back in January, we looked closer at the impact of socioeconomics on school performance in the context of the debate over redistricting at Creekside. Looking at Wake and Durham County, we suggested, the big predictor of how well a school performed on end-of-grade tests was the poverty level in a school, as measured by free and reduced lunch rates. While we didn't perform any data analysis on the correlation between free & reduced lunch rates -- a typical predictor of poverty -- and end-of-grade performance, the suggestion was clear: it sure looked like poverty was a key predictor of academic success. Much to my delight, Duke sophomore Kristen Manderscheid has now completed exactly that sort of analysis, published in the Spring 2008 edition of the Duke Journal of Economics. The same caveats from yesterday's crime analysis still apply: these studies use relatively straightforward analytical tools, should be taken as a starting point for further analysis, and any errors in the reporting or conclusions I draw in this post are mine, not the authors. Manderscheid's paper seeks to try to determine what factors influence the variable success of Durham's schools -- a factor which obviously, she notes, varies by the racial composition. But, she asks, to what extent is it class and income that really are to play here; to what extent is race simply a shortcut for wealth, educational attainment, and family stability? And, Manderscheid asks, are there factors beyond wealth and race that factor into educational outcomes in Durham schools? As we talked about here yesterday, one of the most frustrating elements of Durham's portrayal by outsiders is the use of casual assumptions linking race and crime. The most common -- besides occasional jaded remarks that it's time to redeploy troops from Baghdad to the Bull City, a statement that ignores the actual relative level of crime -- is the comparison of Durham to cities like Newark and Detroit. The meaning of this shorthand is clear: Durham's got a crime problem because it's a racially diverse city with a large black population, and the presence in particular of so many young black males in particular must be the source of crime. Right? It's an easy assumption, particularly for a nation and a region that's struggled with racism, in its overt and covert fashion, since about the time that the first immigrants touched down in North America. And it's one that goes without challenge in largely-white, largely-upper-middle class suburbs in Wake County. All too often, I think the folks in those places assume it's the first of those two characteristics, rather than the latter, that explains the level of violent and property crimes in their community. One of the most frustrating and challenging aspects of being a proud Durham resident is the constant drone of negativity clap-trap about the Bull City that resonates throughout the broader Triangle community, if not the state at large. While on vacation in London a few weeks ago, my wife and I ran into a young couple (not out of their early 20s) who mentioned on a tour that they were from North Carolina. When we told the Catawba County-based husband we were from Durham, his instant reaction, said with a smirk, was, "Oh, I'm so sorry for you." Needless to say, we quickly moved off in a different direction. Interactions like this are, sadly, no surprise at all to those of us who chose to make Durham our home. Most frustrating for so many of us who love Durham is the nagging sense so many of us get that there's a -- subtle and hidden, or overt and targeted -- racism behind the message. Look at local TV stations' message boards after stories of Bull City crime are posted, and you'll see no end to the jibes. Statements like these are, to be blunt, a verbal diarrhea that takes place in the context of America's dysfunctional relationship with race, a topic that Barack Obama addressed this week in a fashion that was more articulate, more persuasive, more important than perhaps any political speech this decade. Yet the racial obsession underlying the excuses and accusations by Durham's mostly-external bashers is something more than unseemly and unnecessary. They are also, if empirical data from statistics are correct, roundly wrong. Tired of the Durham Freeway's dead-end onto T. W. Alexander Dr. just south of I-40? Wishing you could make it all the way down to Apex without blinking an eye? Excited to pay to use one of North Carolina's first toll roads? OK, the answer to some or all of these may be no. Still, the completion of the proposed Triangle Parkway project will mark an important improvement to the Triangle's vehicular transportation system. The Triangle Parkway will pick up at NC 147 (the Durham Freeway) just south of I-40 and will provide a direct freeway connection to NC 540 at Davis Drive; the ramps and flyovers are already designed for the interchange. 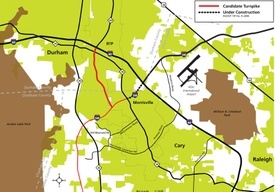 From there, the parkway will continue down through western Wake County, connecting eventually to US 1. Gary's been on a tear of late with a very though-provoking week of posts over at the Endangered Durham blog. But he's outdone himself today with an incredibly in-depth write-up of the historic past and renovated present of the American Tobacco factory district in downtown Durham. I know most BCR readers also read Endangered Durham -- one of the real cornerstones of the Durham blogosphere -- but in case you don't, be sure to check out this post. The beautiful black-and-white photographs are worth the cost of admission alone; the topsy-turvy history of how the complex came to be renovated, after several false starts, is a useful background for anyone not familiar with the history of downtown Durham's most successful renovation to date.